The Purple Kiss is as fascinating to look at as it is to drink. 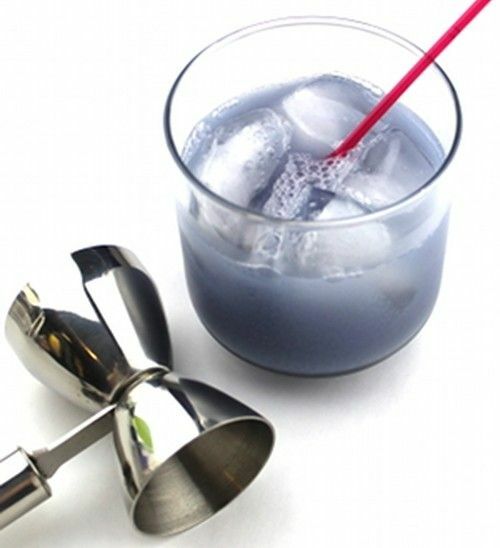 It features Creme de Noyeaux, which is a beautifully purple almond flavored creme liqueur. This drink is pretty sweet, but not as cloying as it might sound. The gin and lemon juice add a nice tangy zip to it, and the egg white smooths the whole thing out a bit. Remember, if you’re concerned about using raw egg whites, an egg substitute product (that’s been pasteurized) will work just fine. Fill a cocktail shaker with ice and add the ingredients. Shake it very thoroughly to mix up the egg white, and pour into an old-fashioned glass, ice cubes and all.